after doing “clear cdp table” on R1 and R2 and waiting about 30 seconds I had success! My next trick was to make Cat1 trunk to Cat2 over Fa0/21 by taking the path Cat1 –> Cat3 –> Cat4 –> Cat2. This was where I had gotten caught up before. I spent a good deal of time on this tonight to really understand it. I ran into an issue you will see here in a minute that cost me a lot of hair! OK, since I would be tunneling a trunk through more than 1 switch I decided to implement Q-Q tunneling between Cat3 and Cat4, basically making Cat3 and Cat4 my “service provider” switches. So, Cat1 fa0/21 was to be a regular old dot1q trunk, nothing special. I set cat 3 fa0/21 to access vlan 12 and mode dot1q-tunnel. 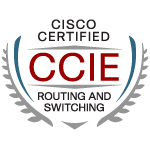 Fa0/23 on Cat3 and Cat4 is setup as a regular dot1q trunk as well. 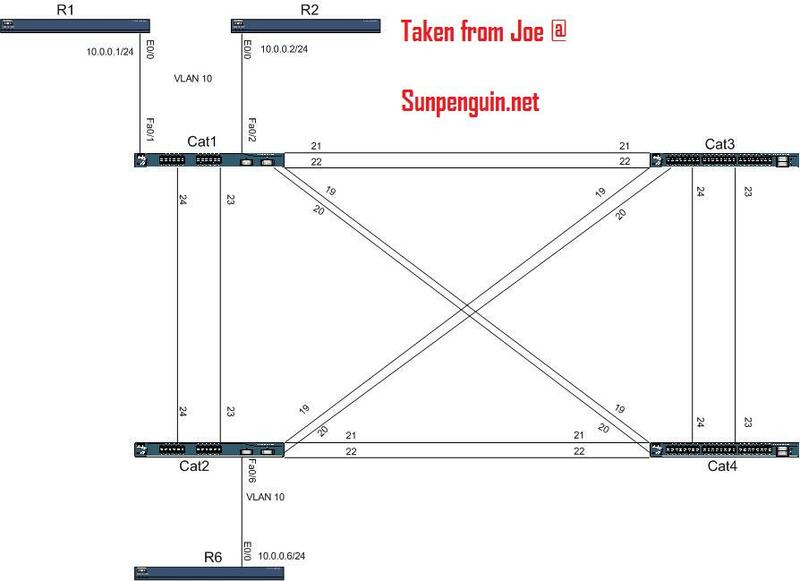 Fa0/21 on Cat4 was also a dot1q-tunnel port in access vlan 12 while Fa0/21 on Cat2 was a regular dot1q trunk.Â The basic idea here guys is that when Cat3 gets a frame from Cat1, that frame will be tagged by Cat1.Â Since Cat3 has access VLAN 12 and dot1q-tunnel on port fa0/21 it sends the frame over to Cat4 double tagged.Â The Cat1 “client” vlan is preserved inside our little Cat3/Cat4 “service provider” tag of 12.Â When Cat4 gets the double-tagged frame, it removes the first tag before sending the frame over to Cat2.Â The same thing happens the other way around from Cat2/Cat4/Cat3/Cat1. Now, if you have a very keen eye, you may have noticed that I manually pruned VLAN 10 from the fa0/21 trunks on Cat1 and Cat2. Why? This is what I was beating my head into the wall for all night! Every time I had the above setup configured, Ports fa0/21 would keep shutting down due to loop detection and going err-disabled. I couldn’t figure it out for the longest time. I had only allowed VLAN 12 on that one trunk, but still every time, err-disabled. The reason a port will go err-disabled in an l2tunnel config is because an l2tunnel port is receiving a frame from another l2tunnel port. hmmmmmmm. I should also note, the exact same behavior was happening between Cat2/Cat4 on the other side. So how to fix this? I just manually pruned VLAN 10 from the trunks going between Cat1/Cat3 and Cat2/Cat4 on those l2 tunnel ports. Since we have a very redundant topology here, there are other unblocked paths along VLAN 10. I verified this by making sure R1/R2 could ping R6 down on Cat2. I think I came a long way with l2tunneling tonight, and it feels good to finally have a better grasp on this. LOL a what you say? Yea I know! I have been slowly chugging away at my Soup to Nuts labs and reading material. I was going to go just take my written again soon, but decided against it. I will just take it when I feel I am ninety days out from taking the lab. No sense in taking it again now and have the clock start once more. Plus it hasn’t even expired yet. I am trying to figure out my dates for the bootcamps as well. I am still trying for the March Chicago camp Narbik has scheduled. The class is still not close to full though. It is getting too close to crunch time for having to put in for vacation. These might become a summer thing since the wife will be off for the summer. I should of been a teacher. Why am I going through all of this when I could have summers off? I still have yet to figure out when to head off to Internetwork Expert’s 5 day camp as well. I really need to get this in and take my lab by the end of Fall this year. My wife is starting to get that look in her eyes with Jake on the verge of starting to crawl. it won’t be long until she starts crying he isn’t a baby anymore :). I did redo my dynamips server on my mac mini a few weeks ago. Since I had a test rack at work setup for Internetwork Expert’s topology I bought more usb nics and rewired my server at home for Narbik’s topology. It is alot easier doing his labs when you don’t have to wait for hardware reloads! It runs like a champ as well. Once I redid all the usb nics to the real switches reworking the .net file was easy and off I went. It’s official! No matter what the outcome, Cisco Systems now has $1400 of my hard earned money. Just wanted to make that quick note. It feels a lot more real now I suppose. I need to book my flight and hotel soon. On another note, I am going on vacation tomorrow! I read a post on GS I recently about a guy that had passed his lab. He said a key part of his success was going on a cruise vacation with his family and relaxing for a bit. It just so happens I already had a cruise vacation planned with my family, so that works out 🙂 For the next week, I’ll be in the warm beautiful weather relaxing with my wife, brother, parents, and sister in-law. A splendid time is guaranteed for all! I figure after I get back I will have about 12 weeks to finish preparation for my lab. I am just finishing up IPexpert Volume 3 labs (I have 3 left to go). I really have not had the time to post detailed accounts of all of them. After I finish volume 3 I plan on redoing some labs. Also, after the volume 3 labs, I plan on dedicating a large chunk of time to just reading. Most of that will be the DocCD. I guess I plan on just starting with the routing config guide and working my way down. Maybe hitting the command references if I have time. In addition, I’ve been playing with the idea of picking up Narbik’s soup to nuts book. I have heard nothing but good things about it from the community at large. Also, if I can afford it and have the time, I’d like to book at least 1 of the 2 Cisco assessor labs, and maybe a mock lab or a handful from another refutable vendor. Send a congrats over to him on Ethan’s site!